If the market doesn’t hit you in the mouth, then the economy will. You may think Mike Tyson is an idiot, but he did say something very smart. Everyone has a plan ’til they get punched in the mouth. Yes, I remember high-interest rates. I’ve experienced the double-digit mortgage (in the mid-80’s it wasn’t uncommon for people to sell a home, and write a check to the BUYER). Rates soared north of 13%, something anybody under the age of 40 can’t fathom. Experience matters. Learning from it matters more! Being skilled in critical thinking is the ability to take one’s thinking apart systematically, to analyze each piece, assess it for quality (accuracy, validity, etc.) and then improve it. It’s the basis of our decision-making ability. Cognitive science has established certain elements of reasoning: purpose, question, information, inference, assumption, point of view, concepts, and implications. Sounds sterile and ideally logical, but there’s emotion sprinkled all over the place. Emotion like feeling stunned…when we get smacked in the mouth. Emotion like feeling disheartened when that punch puts us on our back. Emotion like not wanting to get up when we’re knocked down. Or the emotion of wanting to get back up as quickly as we can to keep on fighting. For more than a decade I’ve heard the story repeated. I didn’t know where it originated until I decided to find out. Here’s an infographic of the story. A 2nd monkey was substituted and the same occurred. The 1st monkey participated in the beating of the 2nd monkey. A 3rd monkey was changed and the same was repeated (beating). The 4th was substituted and the beating was repeated and finally, the 5th monkey was replaced. 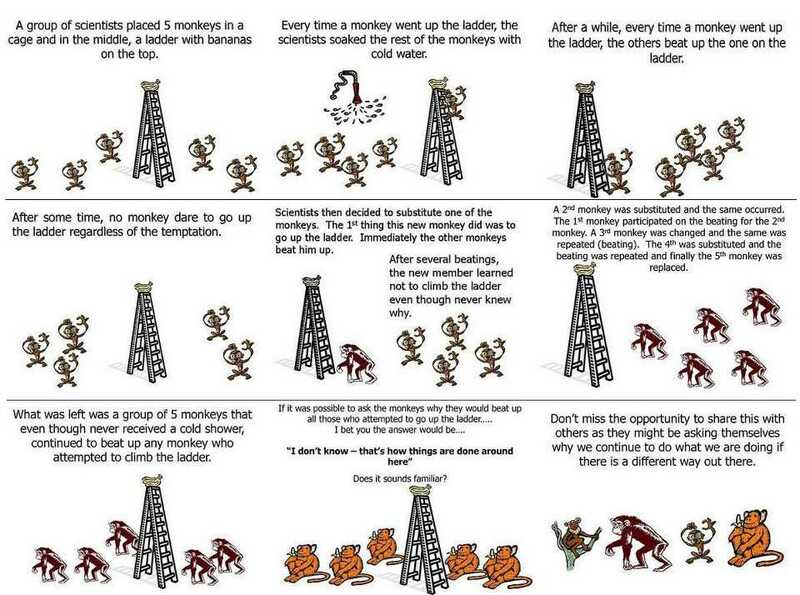 If it was possible to ask the monkeys why they would beat up all those who attempted to go up the ladder … I bet you the answer would be … “I don’t know — that’s how things are done around here” Does it sound familiar? Competing For The Future by Gary Hamel and C. K. Prahalad (1996) seems to be the first citation of such an experiment, but no attribution is given. No experiment is cited. And I couldn’t find any evidence that it’s true. It reminds me of that photograph of wolf pack that gets shared so frequently. It sounds good, but it’s completely false. Fiction. David Attenborough took the photo in question for the BBC’s “Frozen Planet” Series in 2011. It shows 25 timber wolves hunting bison in Wood Buffalo National Park in Canada. The female alpha wolf led the pack, and the others followed in a single file line to save energy as they made their way through deep snow, according to the environmental website Benvironment. Wolf packs are typically about half the size of the pack pictured in the photo from 2011. Most packs don’t hunt prey the size of bison (which is 10 times the size of a wolf), but the larger pack is able to. 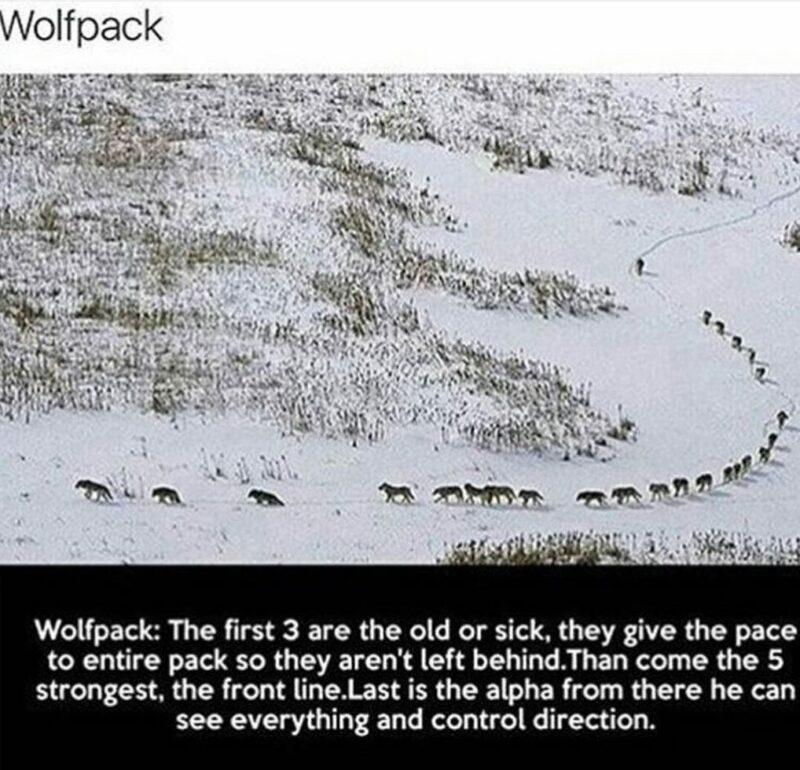 And the wolves walking in a single file line through deep snow is a classic example of how they’re able to use weather conditions to their advantage while hunting prey that’s much larger than them. Also, the idea that wolves have to be on the lookout for “ambushes” or attacks isn’t true, either. Wolves are at the top of the food chain and have no natural predators. Aside from turf battles with other wolves (which wouldn’t start in an ambush) bears are the only threat to wolves in Canada. Even so, experts say that bears are only able to prey on wolf pups because grown wolves are too fast, swift and clever to get caught by them. This doesn’t mean that our assumptions are always spot on. Or that we can’t get it wrong. Truth is, the fact that these (and countless other) stories get widely circulated as fact proves the point. We can deceive ourselves. We can be deceived by others. Our assumptions can lead us to make poor decisions. Enter the punch to the mouth. I might edit Mike Tyson’s quote and say that we all have a plan until our assumptions (or our conclusions) get punched in the mouth. It’s about leadership. It’s about business. Every executive makes some assumptions. Those assumptions are the result of inferences we’ve made. For example, one I often use is getting cut off in traffic. A person cuts us off and we can say to ourselves, “That guy is a jerk.” That’s our inference. Our assumption is that everybody who cuts us off in traffic is a jerk. But we could just as easily choose to have it happen and then say to ourselves, “That guy is panicked for good reason.” Our assumption then might be, everybody who cuts us off has a good reason for needing to get somewhere fast. Maybe they have a family emergency or something of that sort. What we do will be based on our view of the situation. It’s no more logical to assume one than the other really. Our emotions help us ascribe whatever meaning to it we want. If we think the driver who cut us off is a jerk we may exhibit road rage. But if we feel empathy for a person who may be rushing to the hospital for a family emergency, then we aren’t remotely tempted to exhibit road rage. I’ve seen lines for as long as the eye could see to just fill up our car. I’ve had a mortgage with insanely high-interest rates (compared to today). I’ve experienced what the world called, “runaway inflation” where prices soared while incomes didn’t. All these punches to the mouth have shown me – in good times and in bad – that there’s a lot more to it than being lucky or having good timing. Back in 2010, the Huffington Post did a piece on big brands born during bad economic times. On the list were brands like GE, IBM, General Motors, Disney, Burger King, Microsoft and Apple. Of course, scads of businesses closed up shop when the going got tough. Sometimes that punch in the mouth knocks you out. That’s not good. But if you can take the punch, survive it and learn from it…it can be a real advantage. For starters, it shows you what you’re made of. We all like to think we know ourselves, but we only kinda sorta do. We think we can take a punch, but there’s no way to know for sure until you get hit. Truth is, we don’t know until it happens. When business is hard – or the economy goes south – we learn some things about ourselves (and our company) that we wouldn’t otherwise learn. It’d be great if we learned it in real time, but oftentimes we don’t learn it until it’s over. Sometimes after we’ve been soundly beaten. Defeat is only temporary though if we’re determined to stay in the game. The game of business. Only the novices have yet to fail. Those of us who have lived a bit have all had more than our fair share of defeat and failure. Punches to the mouth teach us how to fight better. They don’t merely toughen us, but they teach us how to avoid being hit quite so hard the next time. Duck. Dodge. Perry. Move. Knowing when to retreat and when to attack is a vital skill for every business leader. Increasingly, we rely on accurate data. It’s accessible in real-time with speed unlike anything in the past. I’ve spent countless hours pouring over data provided by organizations (like newspaper companies, which used to be the best depositories of consumer behavior). Information that was kept in printed form, or on microfiche (Google that). I’ve got a ton more data accessible via my iPhone than I’ve ever had before. Part of our punch to the mouth today may be too much data. We’re getting smacked in the face with so much data it’s hard to make sense of it all. Which is why A.I. (artificial intelligence) is so critical to our future. We have to have help to figure out what it all means. But getting hit had value. We don’t look forward to it. We train to avoid it. But until we’re knocked down and dragged out we don’t fully understand the pricetag on achievement and success. We just think we know. Outliers abound. The wannabe actress goes to Los Angeles to become a star. On one of the first auditions, she gets a part. Then another. And another. And quickly ascends to the heights she dreamed of. Meanwhile, millions of others are having a very different experience. They’re working hard to bulldoze their way to success. Knocking down walls. Being knocked down. Bleeding. Sweating. Feeling the pain of the struggle. And our quick success actress is experiencing none of that. Yet. She may find her first punch to the mouth catastrophic because she didn’t see it coming. Quick success may not have made her success-ready. Don’t get me wrong. I’m a big fan of quick success. Just remember, the punch is coming though. If not now, later. Brace yourself. So the punch reveals important data about us. It tells us more about ourselves than any success would ever hope to. If success amplifies who we are, then failure (or the punch) shows the real us. The genuine person we really are. And it may not be who or what we want. So we’re armed with an opportunity to respond to the punch by working to become more like the person we want to be. Good to know, right? And far better to know we can’t yet take a punch than to con ourselves into thinking we can until one day we’re knocked out. It also shows us that our business and our career aren’t linear. Nobody has had a hockey stick career curve. Look at everybody’s Linkedin profile and it appears we’ve all just gone up and up and up. I suppose the youngest among us are the only ones who’ve had that kind of a career curve. That’s only because they’ve not yet been in the game long enough to take a punch. When your career took a punch, what did you do? If you’re still in the game, you got back up. That may look different for all of us. Maybe the founder who didn’t navigate quickly enough to escape the gravitational pull of failure and crashed the company finds herself going to work as a mid-level executive. Maybe the CEO who raised millions of dollars in VC funding, only to realize that the runway wasn’t long enough (and would frankly never be long enough) pivots into a completely different industry sector. Whatever it looks like…it’s a response to the punch in the mouth. A response that otherwise wouldn’t have happened. Learning to fight is part of it. Beating up weak opponents doesn’t make us tougher. But weaker. Getting smacked around shows us a thing or two. Important things. Critical things. I’ve got more wrinkles than ever before. Working out and proper diet are far more critical to my physical well-being than ever before. The metabolism is much slower. So are my reflexes. But it all represents the battles I’ve fought and survived. I may not have thrived during each of them. Nobody does. But I got back up off the pavement. I kept swinging while learning to duck more quickly. Learning to counter punch more effectively. So did you. So did all of us who have experienced tough economic times. I’m not a prophet, but it doesn’t take a genius to realize there’s another downturn coming. Are you ready? Are you prepared to be punched in the mouth? Do you know how you’ll respond? If it’s not your first punch, you’ve likely got some ideas. But if you’ve never been hit before, we’re about to learn if you can take a punch or not. And like every downturn, the market makes winners and losers of us all. I hope you win!